The holy month of Ramadan (when Muslims fast for 30 days) has started. The Ramadan spell has begun in earnest in many restaurants in Chennai. Haleem a recent entrant into Chennai has received loads of love from the city which also loved Nombu Kanju (Rice Porridge) before. 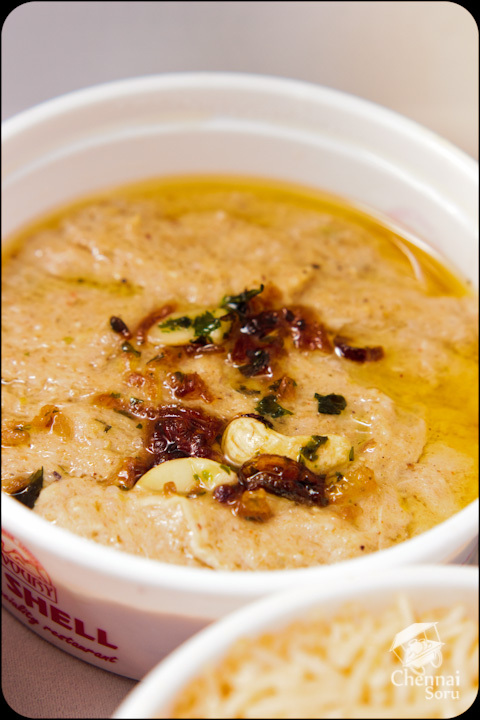 The word Haleem gets its name from Persian for patience because of the time and effort needed to prepare it. Haleem is made of wheat, barley, meat, lentils and spices sometimes rice is also used. This dish is slow cooked for seven to eight hours, which results in a paste-like consistency, blending the flavours. I decided to pit two of the most famous Haleem in town. 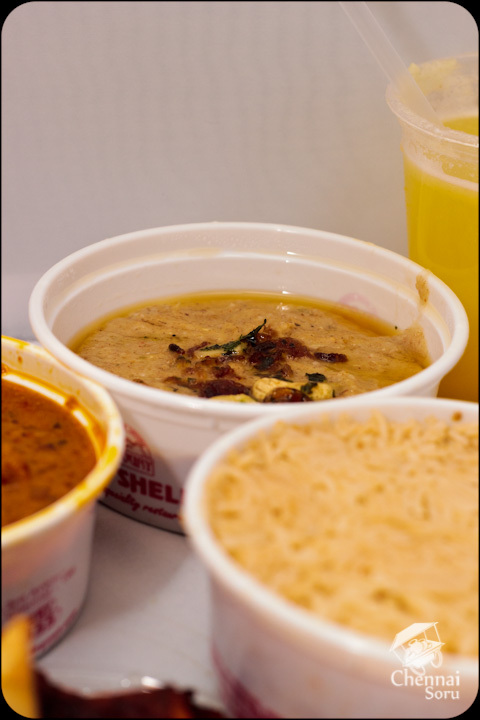 One which has won numerous awards and is shipped over to Chennai from Andhra Pradesh and the other a local grown. 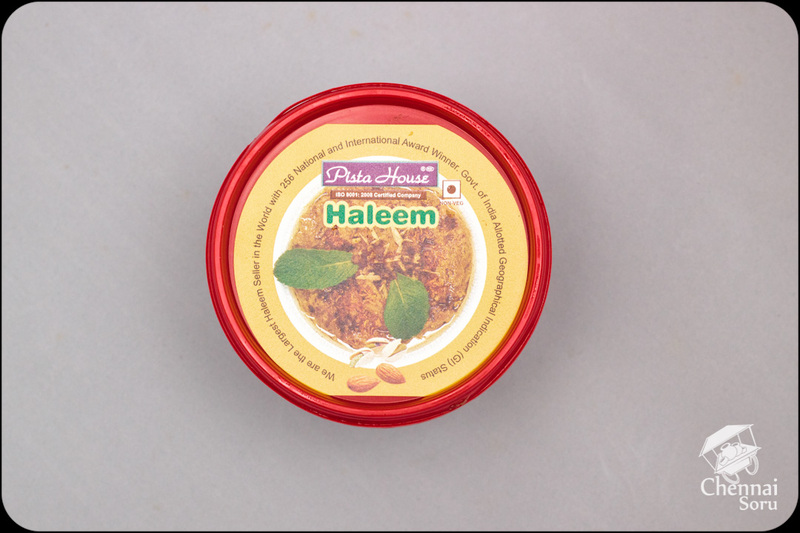 Pista House Haleem Vs Sea Shells Haleem. 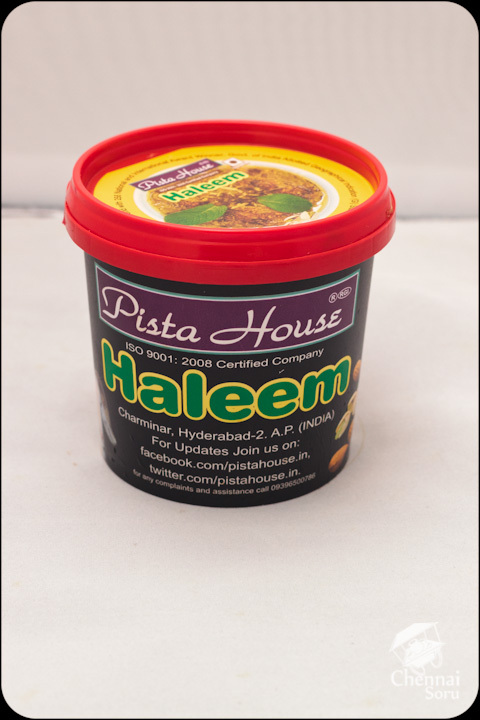 So first about the much acclaimed Haleem from Pista House. It is priced at Rs 160/- every where. That is what is given on the web. But I was charged Rs 180/- at Star Biryani. Never mind that. Going forward: After breaking my fast I pulled a spoonful out of the nice looking jar. Firstly it was soft and easy take out, soft in consistency and tasty. But as I had a couple of spoons I started getting pieces of bones which became an annoyance. 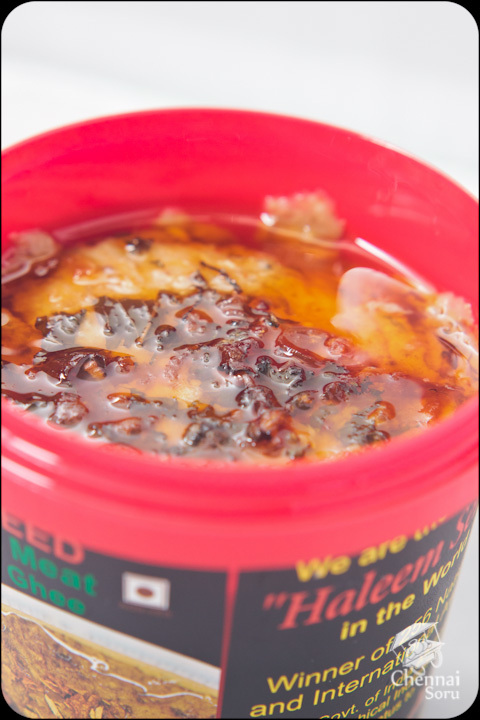 Next up to complete the comparo I took a couple of spoonfuls from the Haleem in the Sea Shells container. This haleem was a part of the Iftar box and I had not purchased a separate container. 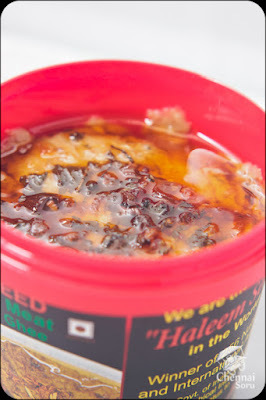 The haleem was much thicker in consistency, maybe they use a different meat to lentils ratio. But it is very apparent that it was much richer and had better flavour profile. 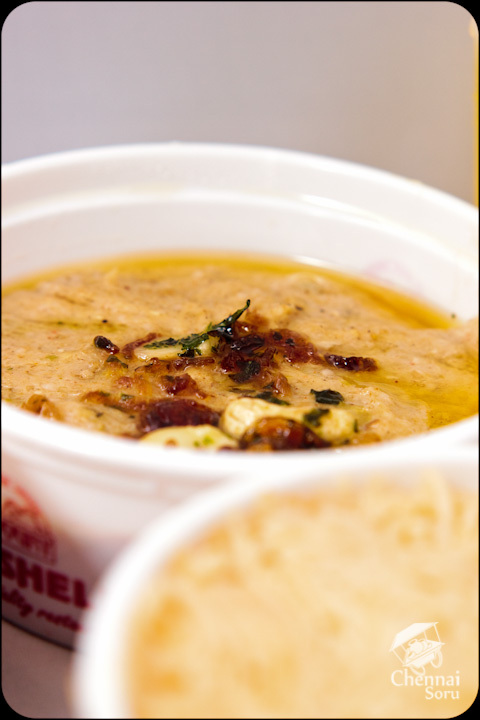 The best of all, the important aspect of relishing haleem was not hampered by the presence of bones. 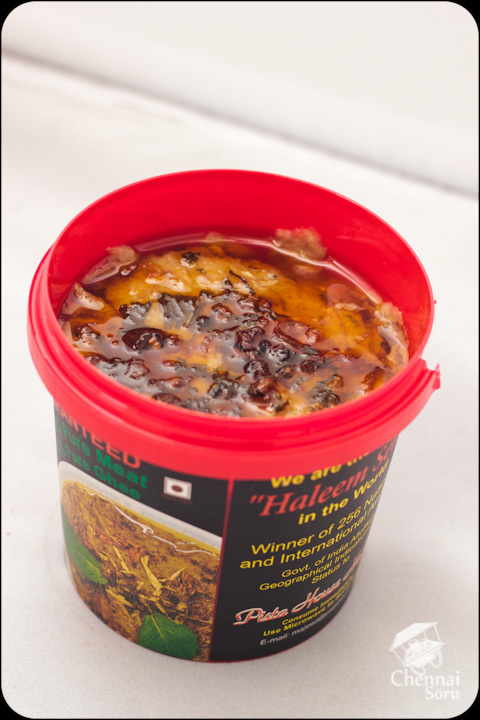 Winner - Sea Shells Haleem, but only by a small margin. I did like the haleem from Pista House, but just that I liked Sea Shells better. It is just my opinion and it is subject to change between individuals. Sea Shells had many outlets all over Chennai. This was picked up at Anna Nagar outlet.